In general, the restaurants that are nearest and dearest to my heart are the one’s that are the least complicated. Just straightforward, quality food. Beautifully sourced and expertly prepared. No foams, no fuss. For this reason, I have always been a big fan of Frankies Spuntino. In the years since opening their doors — first in Carroll Gardens and then on Clinton Street — Frank Falcinelli and Frank Castronov’s food has never failed to put a big smile on my face. This is good, solid, tasty cooking at its best. In June, the gastronomic duo released their first cookbook, The Frankies Spuntino Kitchen Companion & Cooking Manual. It’s a beautiful tome to own, filled with charming fine-line drawings and direct prose. Like their food, it is exceptionally accessible. 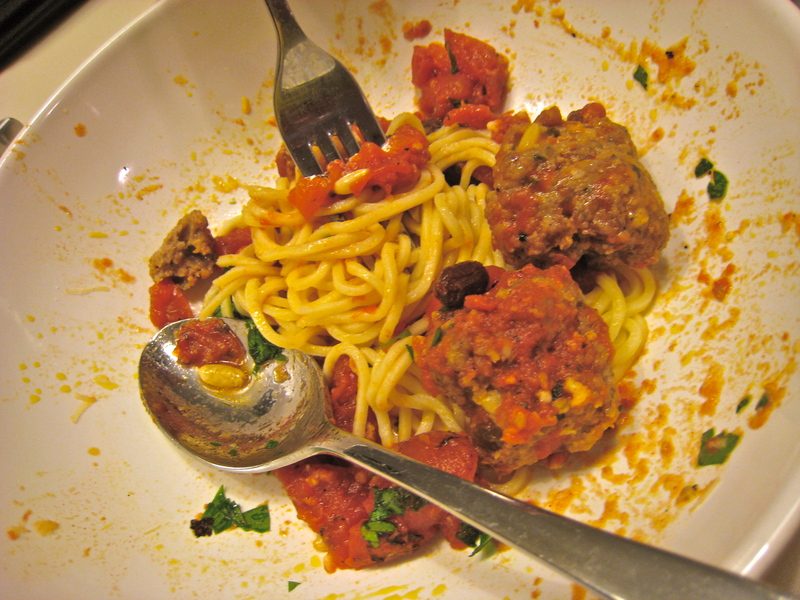 This meatball recipe is mostly theirs, though the basic tomato sauce is my own. While making them at home, I forgot to add the eggs, but did not find that the flavor suffered. Maybe my meatballs were a little springier as a result. If I had to do it again, I think that I would do something to make the raisins and the pine nuts not so obtrusive by either substituting golden raisins for dark. Even better still, I think I would use currants. The pine nuts I might think about coarsely chopping too. 1. Heat the oven to 325°F. Put the fresh bread in a bowl, cover it with water, and let it soak for a minute or so. Pour off the water and squeeze the excess out the bread as best as you can. Tear it into tiny pieces. 2. In a mixing bowl, combine the bread with all the remaining ingredients except the tomato sauce and the spaghetti. The mixture should be moist-wet, not sloppy-wet. If the mixture is too moist, you can adjust it by adding more Panko. 3. Gently shape the meat mixture into handball-sized balls. Space them evenly on a baking sheet or arrange them evenly in a large cast-iron pan. Bake for 25 to 30 minutes. The meatballs will be firm, but still juicy and gently yielding when they’re cooked through. 4. Meanwhile, reheat the tomato sauce in a deep-sided pan that is large enough to accommodate the meatballs and sauce comfortably. 5. Put the meatballs into the pan of sauce and turn the heat up a little. Simmer the meatballs for no more than half an hour so they can soak up some sauce. Any longer that 30 minutes, and they start to disintegrate. 6. Meanwhile, prepare the spaghetti according to directions. 7. Top each serving of spaghetti with 3-4 meatballs and a healthy helping of the sauce. Shower the bowl with the freshly-grated Pecorino and a little finely chopped parsley. Serve immediately.